Advantages of Owning a Reliable, Longlasting UTV | Intimidator Inc.
Purchasing a side-by-side is a big deal. You will be making a fairly large purchase, and need to be sure that you are getting something reliable, that will last a long time get the job done and be worth the cost. If you're looking for the best side-by-side UTV out there, and Intimidator UTVs fit the requirements. At Intimidator, we take great pride in the fact that we offer superior quality machinery, manufactured in the USA, right here at our headquarters in Batesville, Arkansas, all at an affordable price. From the moment the American Steel is delivered, through the entire fabrication processs, to the minute the completed machine rolls out of our warehouse, strict guidelines have been followed to ensure each Intimidator side-by-side is of the highest quality. No one wants to spend thousands of dollars on a UTV to only have to do expensive repairs within a short amount of time. We understand that although fun to operate, your sidebyside is not just a big toy. You need it to haul, pull, transport, and work. It needs to be comfortable, tough, and reliable. 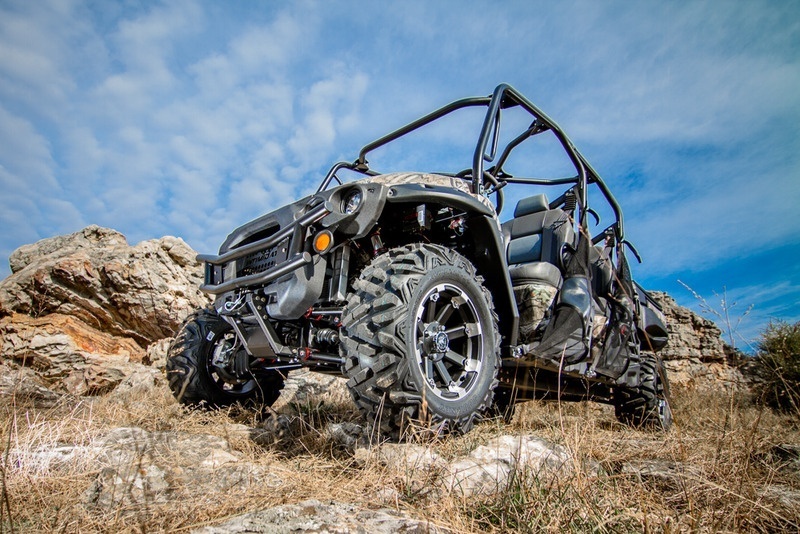 Intimidator's research and development department took that into consideration when deciding to make a UTV with oversized automotive style components throughout our machines. Our plastic, also manufactured in Arkansas, is even automotive grade to give you a sturdy, heavy duty body that can withstand minor bumps and scratches without damaging your UTV. Speaking of heavy duty plastics, the bed sides are made of a type of a very durable plastic that will not shatter or break in extreme cold temperatures. Let's take a closer look at these oversized, automotive style components. We use oversized calipers and our spindles are over twice the weight of many of our competitors, and the wheel bearings are 50% larger as well. This puts extra weight where it is needed. Our UTVs have a Donaldson type air filter which is an oversized cylinder with more surface area than most giving your engine greater airflow which in turn increases performance. A utility vehicle should be expected to work hard and make your job easier, and with regular maintenance last for many, many years. Whether you own a diesel, gas or electric UTV, maintenance is vital to keep your machine running at peak performance. Check your owner's manual for all the information you need on maintaining your side by side. So if you're in the market for a tough, reliable, long lasting UTV, check out Intimidator. We believe we have the best UTV out there. You can visit our website at IntimidatorUTV.com for a full list of specs for each series we have, or you can find a dealer near you to see one in person. To find a dealer, use our convenient dealer locator. If you have any questions about our UTV line, feel free to contact us. We'd love to answer any questions you may have. You can also find us on Facebookand YouTube to see the Intimidator in action. Download our 2015 Product Catalog to see the Intimidator difference!